Items Included: Current on vaccinations and deworming. Comes with a heartguard tablet, 1 year health guarantee, AKC registration, blanket with mom's scent, and health certificate from vet. Will included copy's of both parents export pedigree's and akc pedigree's. His father is 145 pounds with large bone and a big blocky head. His father is a European import for Slovak Republic with great bloodlines. This puppy's grandfather name is Elvis Vom Forsterrain. He won many titles in European. His grandparent won 3 times world champion. Mother is very large and around 120 pounds. Mother is from Romania also has a great pedigree. 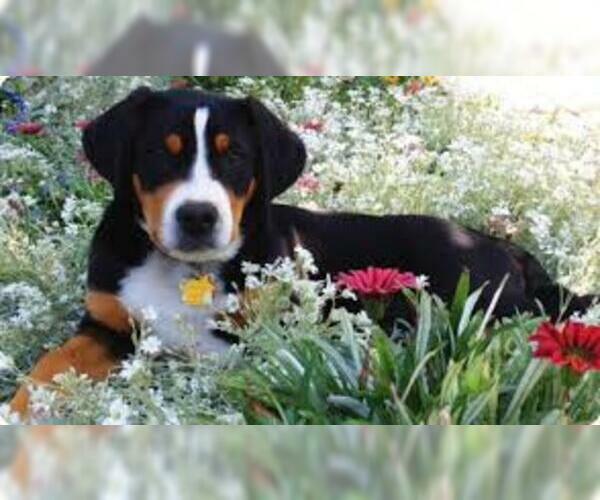 Overview: The Greater Swiss Mountain Dog is a great addition to any family. He is loving and gentle with kids and his strong muscular body makes him a sturdy playful companion. Colors: Black and rust, with white feet, chest, tail tip, muzzle, blaze, and possibly collar; rust color present on legs between white and black. Coat: Topcoat is dense, 1 to 2" in length with thick under - coat. Character: Greater Swiss Mountain Dogs are eager to work, friendly, intelligent, and protective. They are known for being very social and quite obedient. They make reliable watch dogs, though bark rarely. Temperament: This breed gets along well with dogs and most household animals. They make a great companion for children. This breed is very protective and will warn your family of any dangers. Care: The Greater Swiss Mountain Dog requires occasional grooming with a rubber brush to remove dead or loose hairs. Training: This breed is very strong-willed, so training must use a strong and consistent approach. Activity: The Greater Swiss Mountain Dog needs plenty of outdoor exercise, though he will not misbehave if your schedule interferes with daily outings. Health Issue: This breed is prone to bloat, hip dysplasia, and eyelash growth problems (distichiasis).